Essen it time to talk about more games? 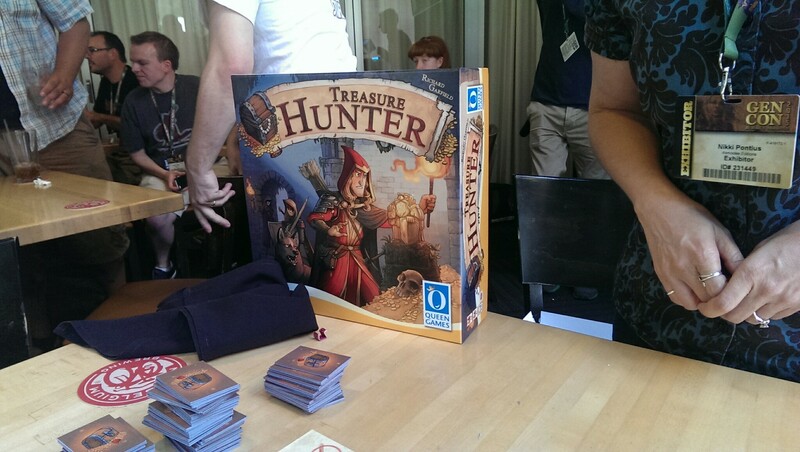 Richard Garfield is at it again, this time with drafting and bidding in the upcoming (Essen release) Treasure Hunter, from Queen Games (and Asmodee. Always Asmodee). Are you ready to… you know… hunt for treasure? This game is pretty simple, and pretty fast-paced. There are several phases to each round: first, you draft a set of cards. These include adventurers, which are numbered, dogs which are also numbered, and special action cards. Once you’ve drafted all your cards, there are three regions you “bid” on for rewards. Here’s the catch; each region has a randomly assigned prize for the Max bid and the Min bid, and either option can be good or bad. So it’s not always about getting the most of a number; sometimes you want to have the least of a number, or none at all. When you “bid” you have to play all your Adventurers matching the region (that’s why “Bid” is in quotation marks – your bid is basically set by how you draft). You can use special action cards that can add, subtract, or multiply your totals, so you aren’t necessarily stuck with your adventurers. For each region, you determine the Max winner and the Min winner (who could potentially be the same person if they’re the only one with cards on the table). The treasures can simply be straight up points, but they might also include points based on the number of a certain card you play, or how many cards valued between 4 and 6 you played, which you can save and activate at the right moment when they are most valuable. After going treasure hunting, you have to pass the row of orcs, and for that you need dogs. Dogs protect you from orcs; otherwise, you have to pay each orc whose strength is higher than your pack of dogs. Then, whoever has the highest Dog strength (that exceeded the orc strength) gets to kill all the orcs their dog strength exceeds, collecting not only points for orc-slaying, but all the money the orcs collected from other players. Nice! The game ends after six rounds. I thought this game was pretty neat, actually. 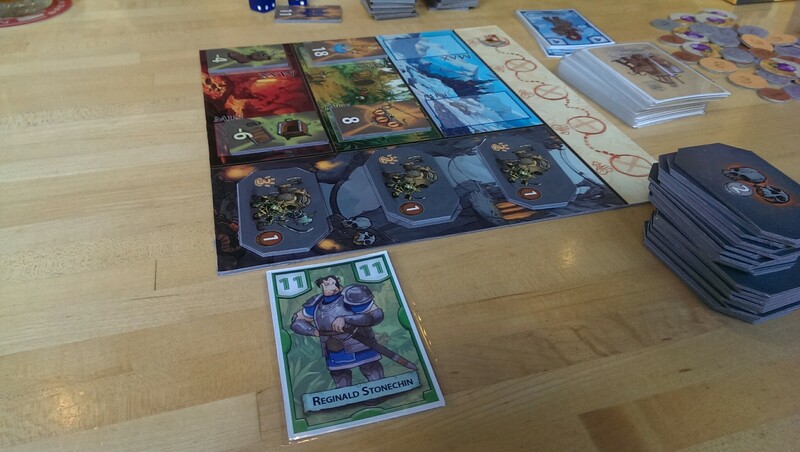 It plays really quickly – the draft is the main course, and it’s fun to try and get the cards you want while preventing others from beating you out. The different regions give you options, and the orc bonus can get you a real leg up, so you have a lot of choices in how you draft – of course, you have to deal with what’s available each round. The Min/Max thing keeps it interesting (sometimes the Min is really awesome and the Max is awful, and that’s always fun to watch everyone scramble to take at least 1 card for that region but not get too many), and the special action cards leave the door open so that you’re not necessarily stuck without options when it comes time to hunt for treasure. I could see the whole game take about half an hour. I’m not sure the full player count (we played with 3, I think it goes to 4), but it’s fast, keeps you involved the whole time, and gives you mounds of treasure to play with. Huzzah! If you like drafting or bidding, (and if your name is FarmerLenny) you should definitely give this guy a look.